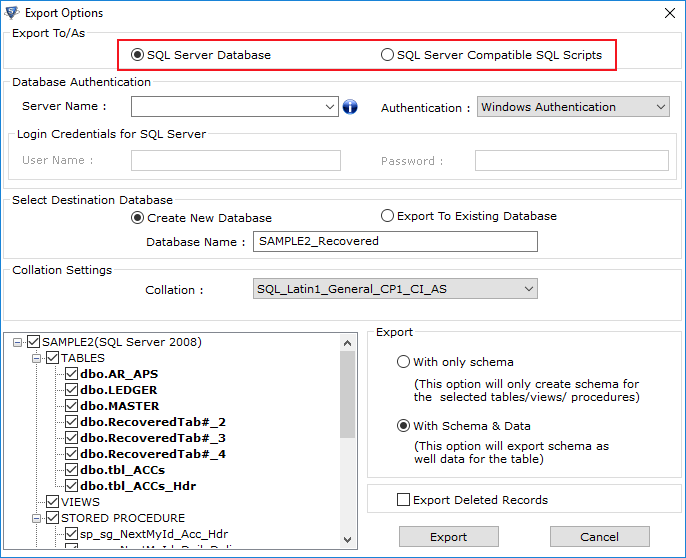 SQL users often find themselves in a critical situation, when they are in a need to restore SQL database with different name. Though the query is common, its solution cannot be considered as a common knowledge. Only a few people know how to do that, while others keep searching for a reliable method when the necessity arises. Considering the lack of knowledge among SQL users in general about this issue, this write-up will focus on this matter. 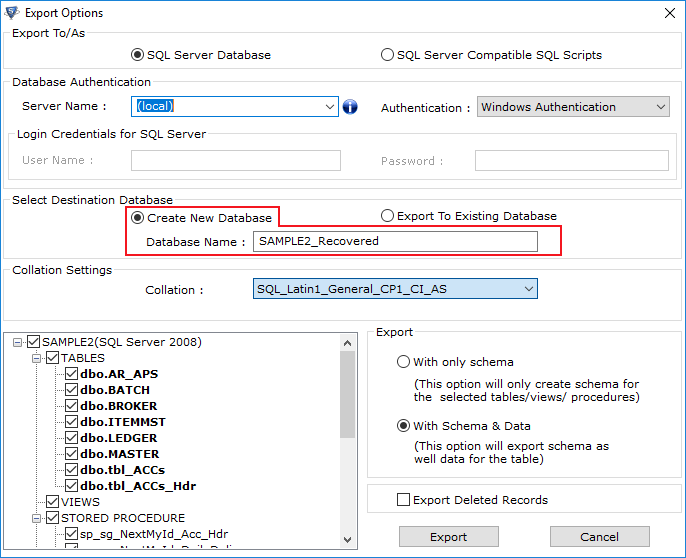 Continue reading this post to learn how to restore SQL database with different name. First, we will clarify the meaning of this particular query. 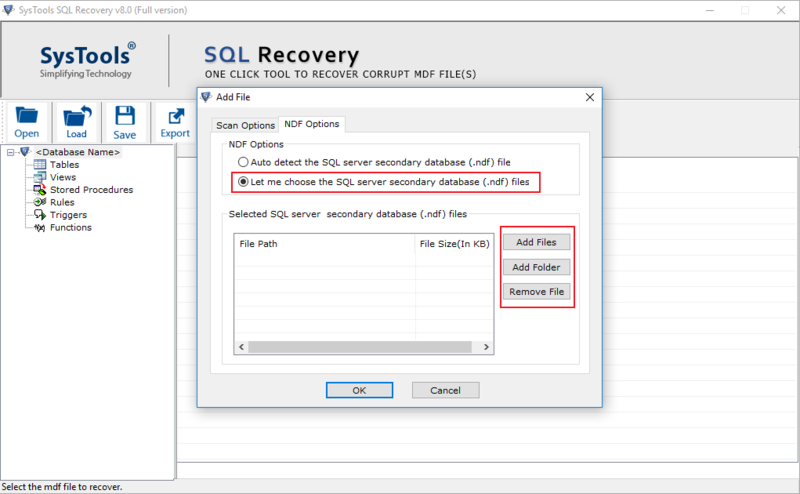 What Does “Restore SQL Database with Different Name” Mean? 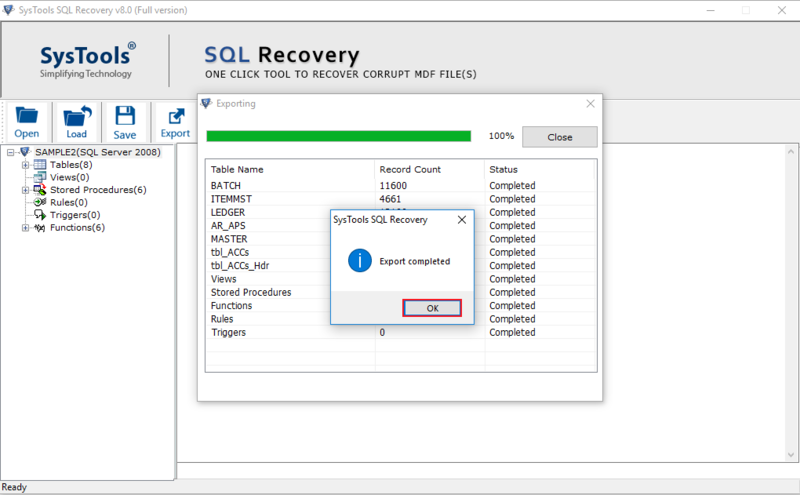 According to the common understanding, restoring a SQL database means restoring from a backup copy. This has to be performed if some severe corruption occurs in the database. The only manual way to get back the database items is to restore the last known good backup. However, time has changed and many advanced technologies have been introduced. 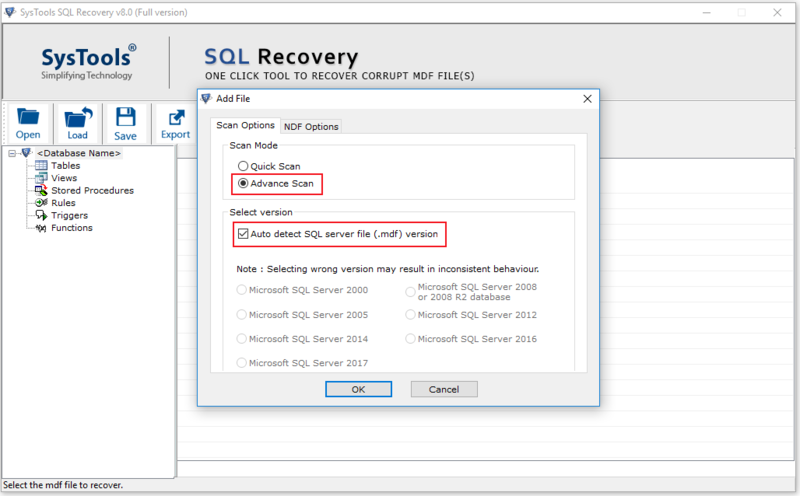 Now, SQL Server users do not have to restore the database from last full backup. 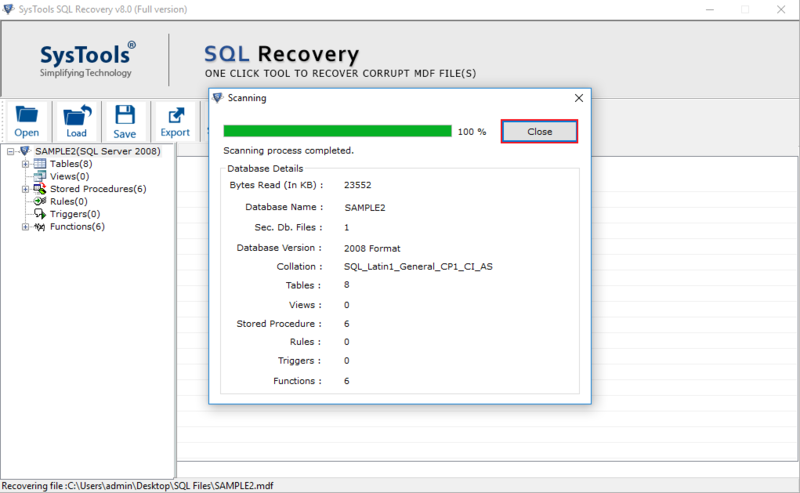 SQL Database Repair Tool offers removal of all types of corruption from the database and restoring the actual database itself without losing any data. It also lets you perform the restoration with a different name. 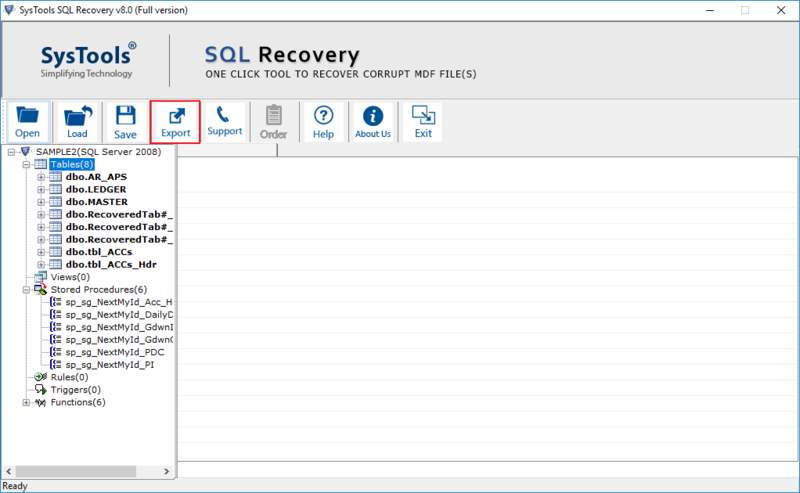 How to Restore SQL Database with Different Name Using SQL Recovery tool? In case you are wondering how to restore SQL Database with a different name, here is the guideline. Following the instructions of this segment, users can easily gather complete knowledge about this approach. Let’s not waste our time anymore and move straight to the guide. 1. Download and install the software. Then launch it on your system. 2. Click on Open button to add the MDF file you have to restore with a new name. 3. If the database is suffering from high level of corruption, select Advanced Scan. 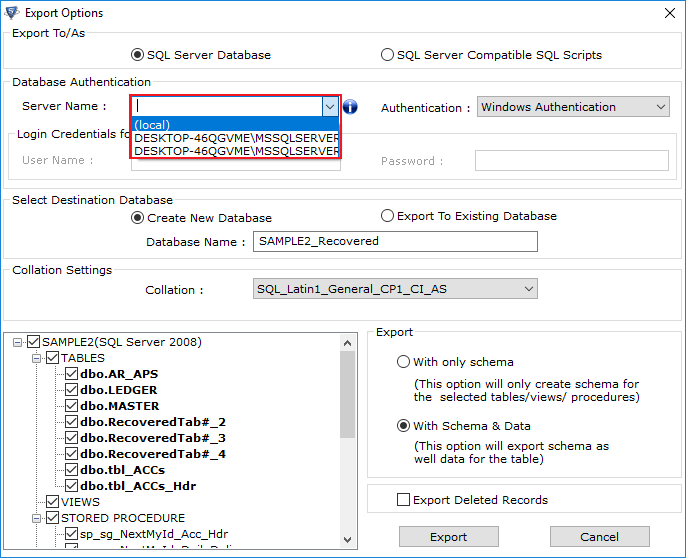 Check Auto detect version option if you do not know the SQL version. 4. You can also select the version manually, but do it only if you are confirm about the version. Click on OK button. 5. Click on the NDF Option tab situated on the same page. 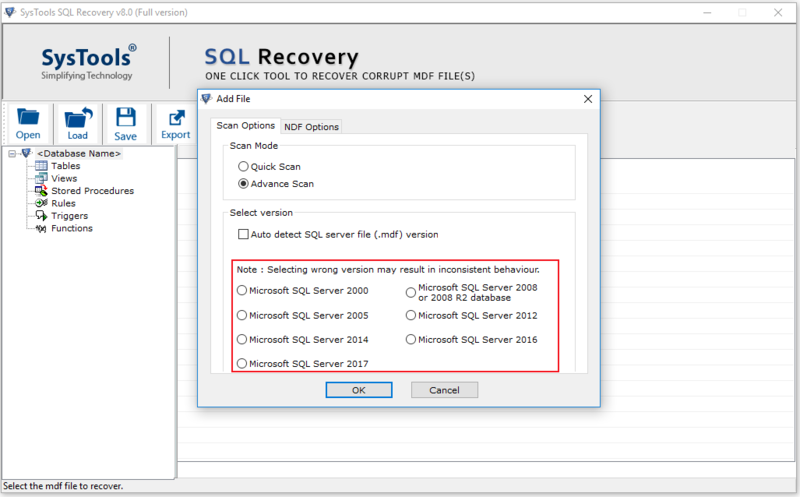 Select the first option to make the software detect the NDF files by itself. 6. 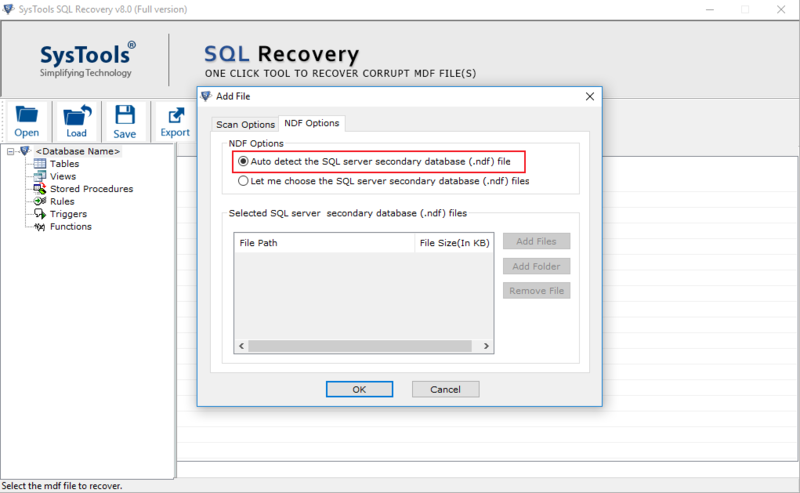 Choose the second option to add the NDF files manually. For that, you can choose either Add Files or Add Folder button. Then click on OK.
7. The application will scan the whole MDF file. 8. When scanning is done, users will get prompted for saving the scanned file.If you click on Yes, the scanning result will be saved in .str format. 10. Now, The program will display all items of the MDF and NDF files for previewing. The items will include all damaged and corrupt files. The preview will include views, tables, triggers, stored procedures, etc. 11. 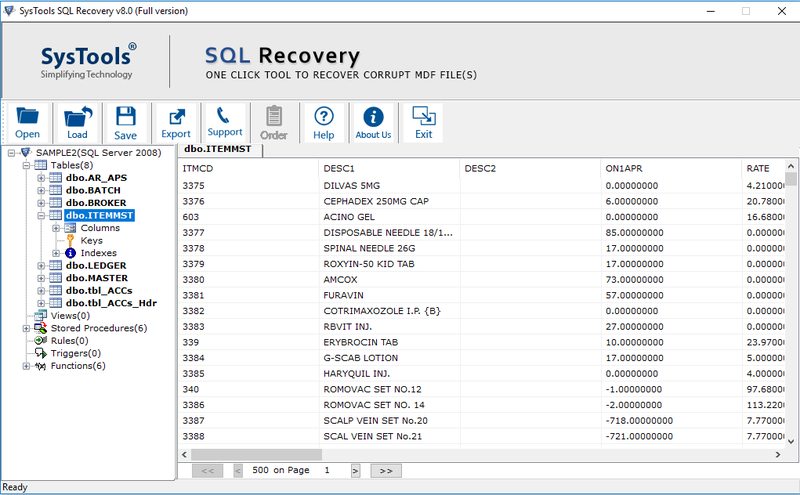 On the left panel, all the recovered SQL database components will be displayed in tree structure format. Select on Export button. 12. 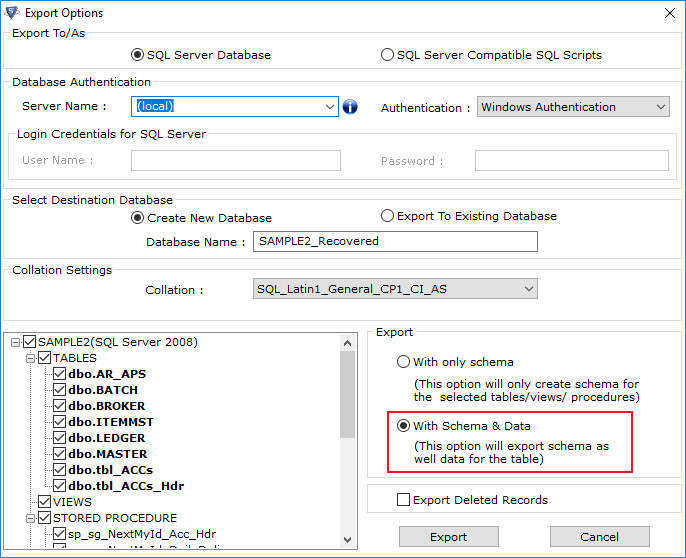 On the next page, select SQL Server Database as output format. 13. For Database Authentication, enter Server Name and Authentication mode. 14. 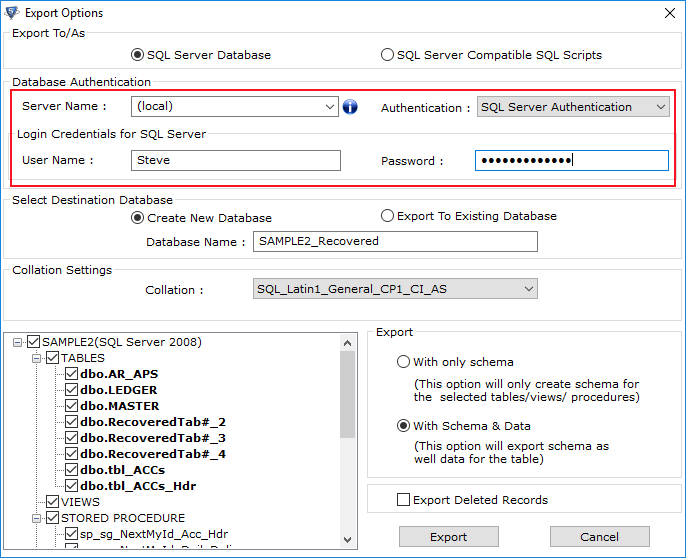 If you choose SQL Server Authentication, add Name and Credentials of SQL Server. 15. Now, choose Create New Database and add a different name for the database as per your choice. 16. The default collection settings will be shown. If users want, they can change it by choosing from the drop-down list. 17. Now, choose the database items you wish to restore from the left side. On the right, choose ‘Schema and data’ option. Then, click on Export. 18. 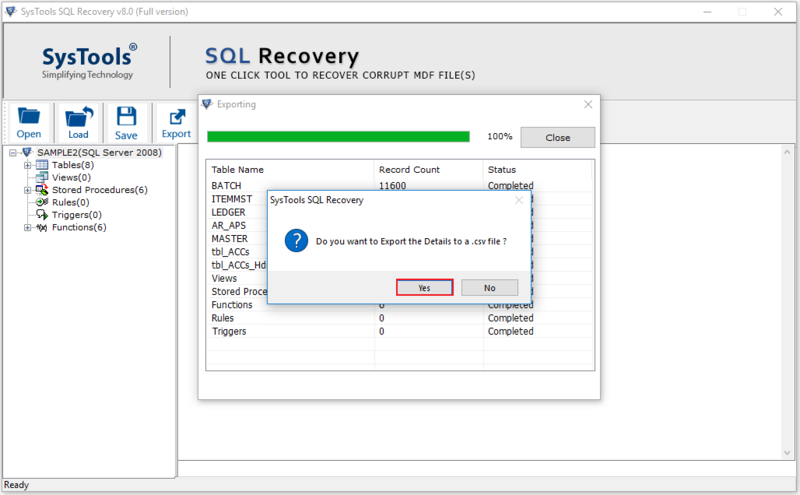 Export Completed message will pop-up upon the completion of restoring process of SQL database with a different name. Click OK.
20. If users want, they can save the export report generated by the tool. 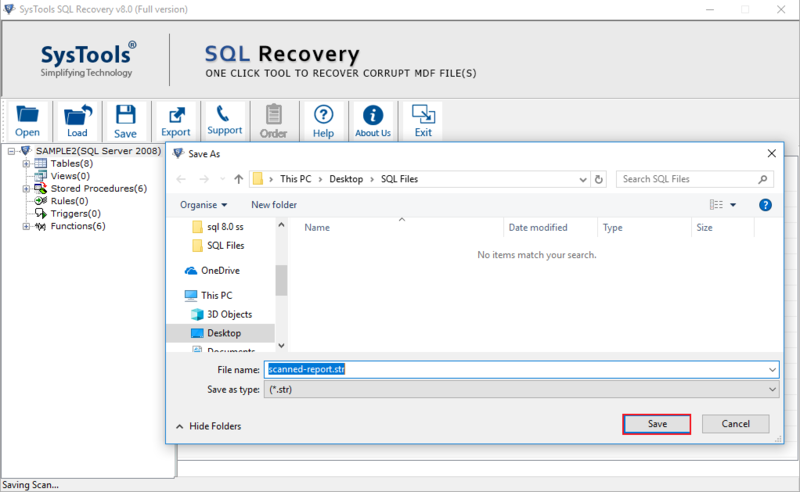 For the users who need to know how to restore SQL Database with different name, here is the solution. 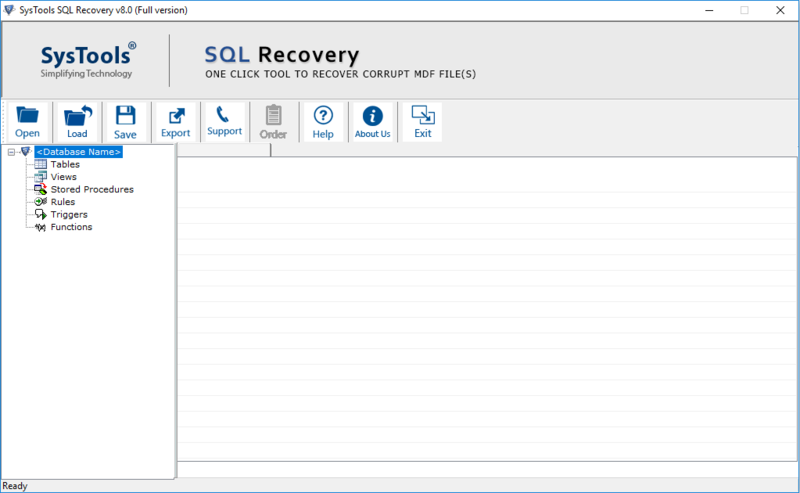 It is evident from the discussion that SQL Recovery Tool is the only viable option. 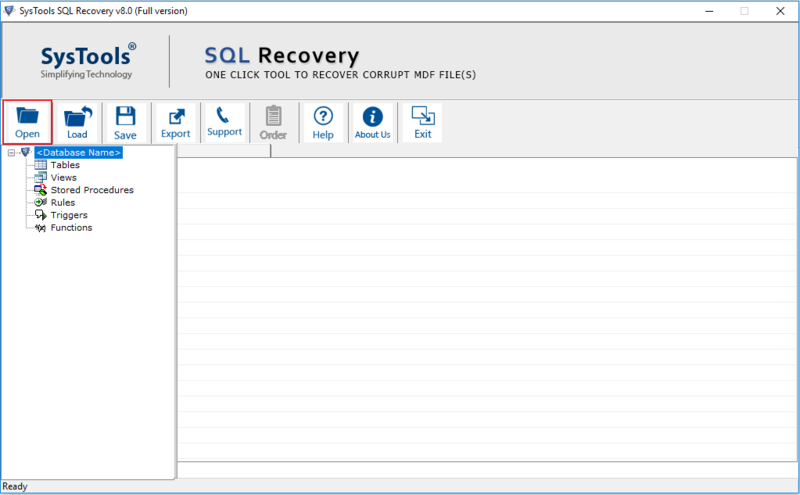 It allows users to restore the damaged or corrupt database in a healthy state. Now that you have gained the complete knowledge about this process, we expect you to apply this approach whenever deemed using the software.